Congratulations to "Western Engineers in Action" team members Jackson Chin, Andrew Bebnowski and Karn Kalra, winners of the 2018/2019 World's Challenge Challenge. Richelle Bird (Right) and Robyn Masters (Left), PhD Students from School and Child Psychology, Faculty of Education, and Medical student Michelle Quaye (Centre), were winners of Western's 2017 World’s Challenge Challenge. They competed in the World's Challenge Challenge Global Final, which took place June 3-7, 2018 at Western. Western University has held the World’s Challenge Challenge over the past five years during International Week. More than 30 teams compete annually by presenting their unique ideas to a panel of academic and community leaders. The winning team members each receive $1,000 to help fund an international learning experience AND have the opportunity to compete in the World's Challenge Challenge Global Final, for a top team prize of $30,000. Students will form diverse teams of three, think of a problem that the world is facing and present their solutions to a panel of judges. The first prize is a $1000 scholarship per team member to be used on Western-sanctioned international learning opportunity (study abroad, community engaged learning opportunity, exchange, international field courses, Alternative Spring Break, internships, field research, or other University-led experiences). The winning team will also have the opportunity to compete in the World's Challenge Challenge Global Final, which will be hosted at Western in June, 2019. Complete an application online with some basic information about your team, topic and proposed solution. Then develop a 5-7 minute presentation that explains your solution to a global problem or issue of your choice with a 3-5 minute question and answer period to follow. Teams will be invited to present in January. Those selected to move on will present to a panel of academic and community leaders in front of a campus audience on February 7, 2019. Teams will be given a score based on a variety of criteria, including how their idea supports one of the UN Sustainable Goals, the impact and feasibility of their solution and their presentation style. A complete rubric will be supplied prior to the competition. See the scoring rubric. For inspiration, see our IDEA list. This competition is open to: undergraduate and graduate students at Western University and Affiliated University Colleges (Brescia, Huron, King's). Participating students may be full-time or part-time, and applications are welcome from every faculty. We encourage teams to bring together individuals from diverse backgrounds or areas of study. Only teams of three students will be accepted. The World's Challenge Challenge is an exciting way to engage in discussion and debate about world issues, and to bring your own ideas to the table. Plus, the winning team will receive $1,000 each to participate in an international learning opportunity - broadening their international experience. 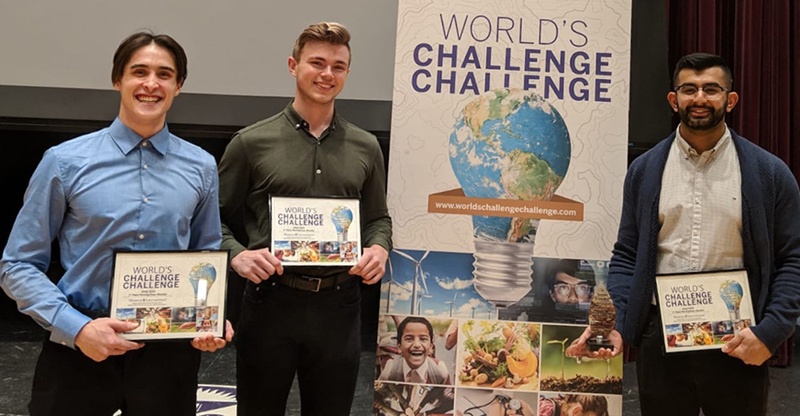 The winning team will also move on to compete in the World’s Challenge Challenge Global Final, taking place at Western in June 2019, for an opportunity to win a top prize $30,000 ($10,000 per team member). Western strives to bring together individuals with a broad world view, seeking to study, influence and lead in the international community. It starts with one idea, one discussion. Who knows where it may lead? Student teams selected to participate will present in front of a panel of Western faculty and staff. The finals will be judged by a panel of Western academic and community leaders. Western International thanks Brescia University College, Huron University College, and King's University College for helping to support this annual campus competition.